Don't speak Japanese? Don't worry. There's just enough English on the box for you to figure out that it contains Lotte Yukimi Daifuku Mochi Ice Cream. A year and a half ago on a trip to Honolulu, I spotted a display in the Shirokiya department store window that confused the hell out of me. There, in a glorious rainbow of colours, was a selection of round little flat things that either looked like squashed gummy pool balls or miniature dead jellyfish. Foodie curiosity got the better of me, so I popped into the store where a man at a counter of refrigerated glass cases was selling the strange treats. I asked him a question or two, but we didn’t get very far. His English wasn’t very good, and my Japanese was even worse (ie. doesn’t exist), but I picked up words like red bean, rice, and cream. I handed over some greenbacks and pointed at (if memory serves) what I gathered to be the chocolate flavour. I took a bite … it was utterly bizarre, but entirely good. The texture is crazy. The sticky, stretchy mochi shell — not solid, despite the freezing temperature — pulls away from the ice cream inside as you try to bite off a piece of it. It’s gummy and cold, alien yet familiar. The shell has almost no flavour, but its texture messes with your mouth. Vanilla: Straight forward. The filling is a light vanilla ice cream, minus the cream. Without a strong flavour to the ice cream, the shell’s taste is more pronounced, especially once the milk has melted away, leaving only the mochi in your mouth. Chocolate: The real winner. Not very sweet, and not very creamy, but with enough chocolate to be enjoyable. Compared to other chocolate ice creams, the filling is middle-of-the-road at best, but the shell makes it better. If the whole box contained nothing but these, I’d be a happy fella. 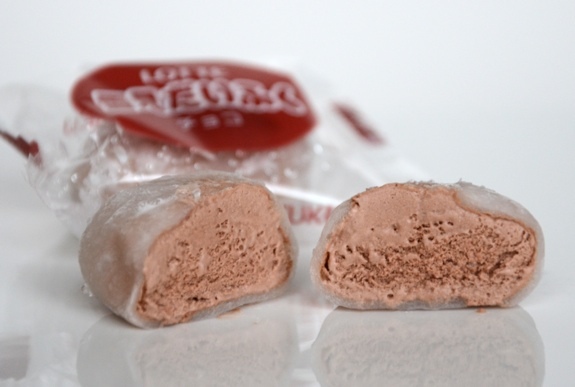 The outer shell of chewy mochi rice paste is wrapped around a core of chocolate ice milk. The mix of textures is neat. Cost: $7.37 for a box of 21 pieces, each one 14 ml, at T&T in West Edmonton Mall. Value for cash money: Not cheap, but it’s also easy to spend $7 on a tub of Haagen-Dazs, so no complaining from me. Availability: Well-stocked Asian specialty stores. Look in the freezer case next to other ice cream products. Nutrition? : 67 calories per 3 pieces. Remarkably low-cal. Likely reason? Made with skimmed milk powder, not cream. Others? : I’ve tried a strawberry version from another brand, and it was equally (if not more) delish. There are more flavours out there, and more takes on the same basic formula, so try them and see what you think. You may have a greater selection in your corner of the world than we do in Edmonton. The verdict: It’s a foreign snack that’s both mind-bendingly different, yet not challenging at all. Kids will get a kick out of it. 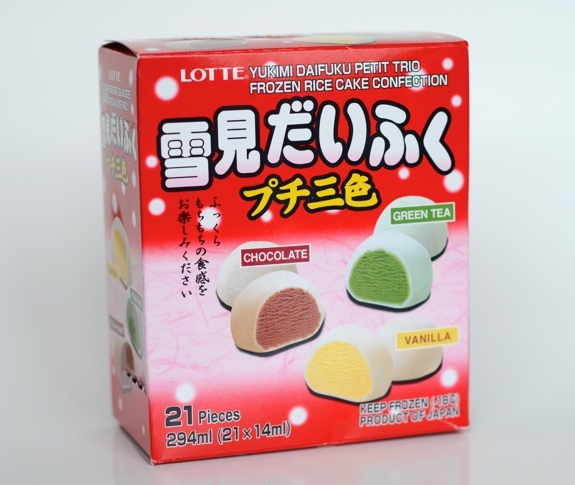 Individual packaging for each piece of Lotte Yukimi Daifuku Mochi Ice Cream. I hope you get a chance to go back to Honolulu soon! I am on Vacation in Honolulu now and I am saddened that I will not be able to enjoy the best mochi that I have eaten, like I have been everyday for the last week when I get home. When you do go back make sure to visit Bubbies! Bah! I just got back from Honolulu without having made a visit to Bubbies! 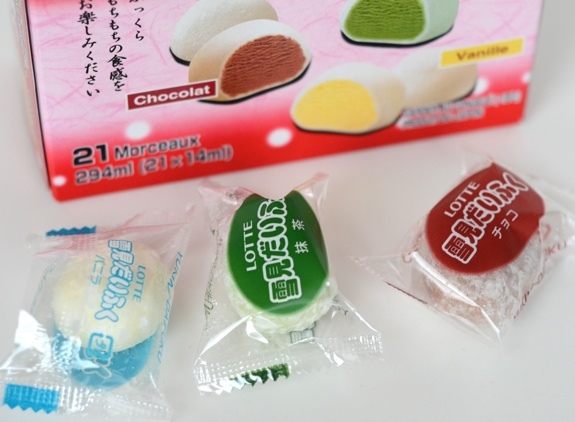 I found the website online, and it looks like it’s a great spot for mochi ice cream. (And a convenient location near the U of H, too!) I’ll have to check it out next time I’m there. I think I’ll pick up a box to try next time I’m wandering around T&T. How can you not love a store that sells both mochi ice cream AND disposable underwear? I know, eh? There are so many wonderful things at places like T&T that go untried because few people outside of a specific cultural group — folks who grew up with the products and know what they taste like — would care to drop $7 on a box of something they might hate. Curiosity often gets the better of me, overriding my cash-cautious instincts. 🙂 Hope you like these!